A tale as old as time Beauty and the Beast is one of the most iconic Disney movies, and the hotly anticipated live action remake has hit our screens. Sticking true to the premise of the original story, Belle (Emma Watson) is a strong willed young woman who is defiant in breaking free from the small, narrow minded village and adamant she will not marry the self obsessed village hottie, Gaston (Luke Evans). Meanwhile in the castle nearby the Beast (Dan Stevens) resides following a spell from the enchantress who cursed him and whoever was living there, only to be broken should the Beast fall in love - and be loved - before the last petal falls from the Enchanted Rose. I am throwing it out there early on that I am not the biggest Emma Watson fan, and was wondering whether I could look past this and enjoy the film. I did spend a portion of the film having flashbacks of Hermione and thinking will you please untuck that dress, but overall she does quite the dazzling job at portraying Belle. Dan Stevens had quite the uphill battle having to push past the CGI and make his character visually believable, which he did. As with any remake change is to be expected and you will come away comparing it to the animated film. 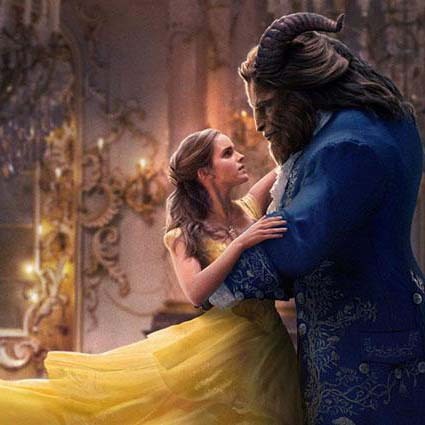 It very much focus on the love story between Belle and the Beast and discovering inner beauty. Despite the unease she experiences to begin with, I think most us would be petrified at the very thought of being locked up forever by an angry beast in a crumbling castle, she however warms far too quickly to him without there being any real character development. The Beast is somewhat on the sidelines and although there was some eluding in the prologue to set the scene on how he became a Beast, the focus remains firmly on Belle, her journey and snippets of her past. It is incredible to see how far animation has come. It is certainly evident from the outset that this is no half-hearted effort. I sat there totally engrossed on more than one occasion feeling like I was in the thick of it. The Beast’s kingdom was dark, gloomy and had me, metaphorically on the edge of my seat. Despite knowing the film inside out it didn't feel predictable. We cannot talk about Beauty and the Beast and not mention the talking furniture whom actually steal the show. Emma Thomspon plays the talking teapot and the mother figure throughout the film bringing the air of reason to all. Chip, although not as cute as the animated number, you are still going to want him in your life. The real favourite was Lumière, the candelabra. Get past Ewan McGregor’s eccentric stereotypical French accent and he is just oh so loveable. Gaston (Luke Evans) is bang on what you expect, self obsessed, narcissistic, and a swagger that oozes arrogance. I would like to mention the ‘exclusively gay moment’ between LeFou that caused some uproar, what an overhype that was. Why this should even cause outrage when this is 2017, is beyond me. The accompanying sing-a-longs were perfectly placed, with Watson, Evans and Stevens doing a far better job than expected. Thankfully those of us who are true to the original film will be happy as some of the classics were included as well as some new catchy tunes. Be Our Guest was a vision of jam packed action, proving to be visually the most vibrant and memorable part. Sadly I was a little let down by the iconic Beauty and the Beast which was flat and didn't bring the elegance and emotion to match the pinnacle dance between Belle and Beast. Beauty and the Beast is magical, witty, pulls on the heart strings and keeps you on your toes. It’s not easy to remake a classic and with the best will in the world it wasn’t ever going to replace the animated version. It has stayed true to the nature of the original film with some slight changes and didn't leave me disappointed. This 129 minute film is a must watch, in fact I would happily go right now and watch it again.